Expectant mothers in crisis give birth to thousands of babies every year. Many would have to be sent home in a disposable diaper wrapped in a small hospital blanket...and “home” for too many of these mothers and their newborns is a shelter, their car, or sometimes the streets…but Warm Hearts Warm Babies, provides many basic needs…blankets, sleepers, gowns, diapers, in a custom diaper bag made by volunteers. Warm Hearts Warm Babies serves crisis pregnancy centers, Ronald McDonald Houses, hospitals, area clothing pantries, and shelters. 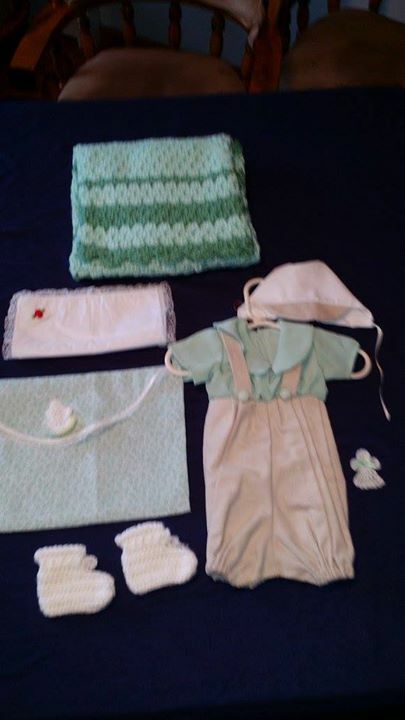 The agencies and hospitals request many layettes for girls and boys every month. Nurses and agency staff determine who receives them. …And for too many of Colorado’s smallest citizens, sadly, this time is way too soon after birth. One out of eight newborns is born prematurely. Many of these are “micro” prematures, born between 22 and 32 weeks of gestation. Some of these have birth weights less than one pound. 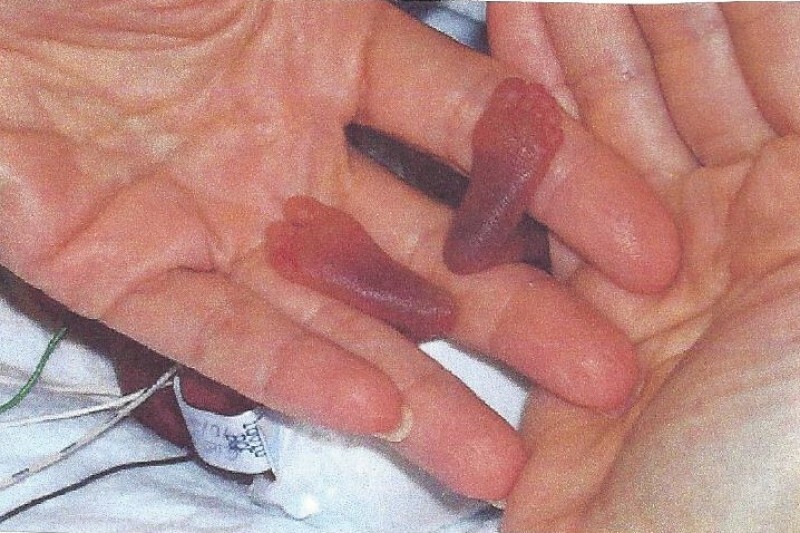 Doctors and medical teams try to save every such premature baby. Young mothers in crisis can only watch helplessly, praying for a miracle. We understand the trauma these young women go through. If the child dies, the mother must mourn. To do so, she needs to be able to dress and properly say “goodbye” to her baby. 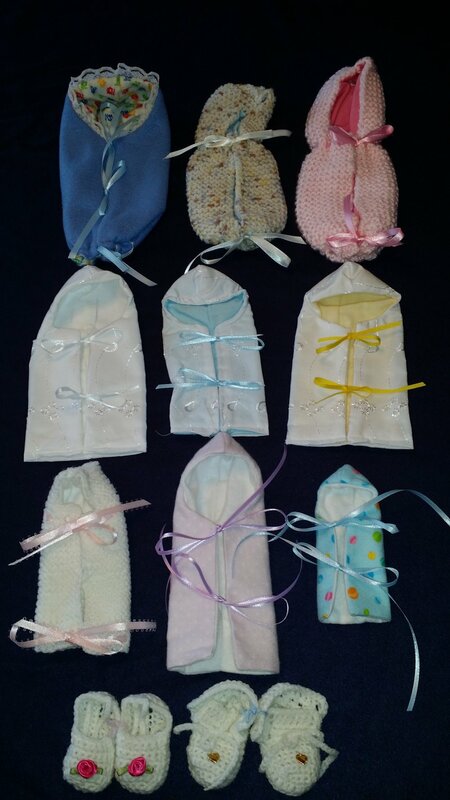 Warm Hearts Warm Babies helps immensely here—we provide burial layettes for one last outfit and blanket to be snuggled in. Our smallest burial buntings are kept in emergency rooms where most miscarriages happen. Warm Hearts Warm Babies, a Colorado 501(c)3 organization, is an all-volunteer organization. Our mission is to provide clothing, blankets, and essential items to premature and newborn infants in crisis. We are strictly volunteer—no one is paid. Contributions received are used to buy supplies and pay rent for storing material and finished items, organizing, packing, and distributing them. These expenses, while minimal, are nearly $1,000 a month. A small contribution goes a long way for Colorado’s smallest citizens. A letter posted from the President of the Board says: S.O.S. ..."Or maybe I should say S.O.O. (Save Our Organization) I feel compelled to advise our WHWB members of the dire financial situation our non-profit group is in. Each month our operating expenses run $1200.00- - $1300.00. This includes rent, electric, insurance, printing, and various imperative items. It takes $14,000 to $15,000 yearly to operate WHWB and we simply do not have the funds. Please help by donating to the gofundme site. 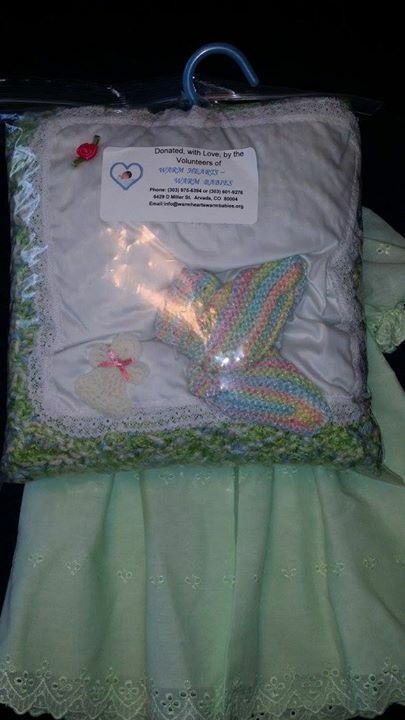 Thank you, Jean Jones"
More pictures of some of the burial items Warm Hearts Warm Babies supplies to the hospitals and crisis centers. In memory of Patricia Lawlor from your friends at ERA Landmark Real Estate. In Loving Memory of Patricia Lawlor. From the Walker Family. In Loving Memory of Patricia Lawlor. A gift from the families of Lawanda Richards, Carolyn Ipsen, Dwight Richards and Irina Richards. Thanks for making a difference in so many lives.